After receiving numerous requests for adding a special section just for Apprenticeships, we had absolutely no reason not to do it. But we decided to do a bit more: we’re making it a FREE category! From now on and for an unlimited time, employers can post their HVAC, Refrigeration and Plumbing Apprenticeships for free on HVACJobsCenter.com. We already had a free plan for Internships but these were mostly for Mechanical Engineering students. 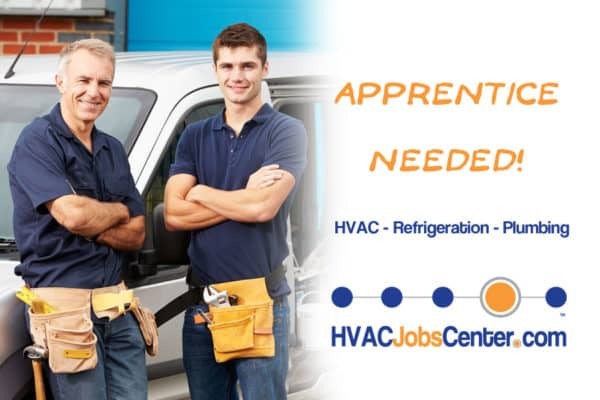 Given the large amount of service companies and HVAC Technicians using HVACJobsCenter.com, it only made sense to have the same for HVAC Apprenticeships. Then make sure you select Apprenticeship as your Job Category. Once you have filled up all information, you will be brought to the ‘Select Plan’ page and will see available the Apprenticeship or Internship : Free plan selected by default. Scroll down the page, click ‘Continue’ and your apprenticeship is posted. Important: offering apprenticeships for free is our way to give back to the HVACR & Plumbing community, so please don’t try to abuse the system by using this free plan to post actual jobs. We do a manual verification of each job posted on HVACJobsCenter.com and make sure each one follow our guideline. Any job posted in the Apprenticeship or Internship categories with the Free Plan which doesn’t belong there will be deleted without notice. We also reserve the right to suspend any fraudulent account. Thank you for your cooperation.